Short history of the ‘97% climate consensus’. Surgeons don’t need to wash or sterilize instruments between patients. The world was flat & the sun revolved around the earth. It was impossible for man to fly. It was impossible for man to breathe above 45mph. It was impossible for man to go faster than the speed of sound. It was impossible for man to escape earth’s gravity. It seems that consensus can be wrong !! 2. Consensus is political methodology; it’s NOT the scientific way, which is only based on facts & data. 97% of statistics are made up,… the other 9% are real !!! This has been quoted ad infinitum by politicians & hack journalists. As we know from our daily lives to get a consensus on anything is unusual, so to get 97% is remarkable. To get 97% 4 times from different data sets is unbelievable …really…it’s unbelievable !! So that data needs investigation, lets just look at the figures from the – Doran & Zimmerman (2009) & Cook et al. (2013) studies. 1. – Doran and Zimmerman, 2009. 97% consensus study. The American Geophysical Union (AGU) is a nonprofit organization of geophysicists, consisting of over 61,000 members from over 146 countries. From the 61,000 AGU earth scientists, they solicited 10,257. ( The other 50,000, that were known to be critical of the AGW theory, including: solar scientists, space scientists, cosmologists, physicists, meteorologists and astronomers, were excluded !! ) Of the 10,257 only 3,146 replied. … leaving just 77 scientists who were then asked 2 questions. [The 77 were chosen (after ranking by number of papers written) accepting ONLY those who were in government-paid positions. NO private employed or retired scientists were allowed.] The first question asked respondents to compare current temperatures to the pre-1800s, (the depths of the Little Ice Age), and asked whether it’s warmer now.!! Doran & Zimmerman then chose to highlight the views of that subgroup of 77 scientists, 75 of whom thought humans contributed to climate change. The ratio 75/77 produces the 97% figure that pundits now tout. 75 of 3,146 respondents is only 2.38%. 75 of 10,257 contacted is only 0.73%. 75 of 61,000 possible is only 0.12%. 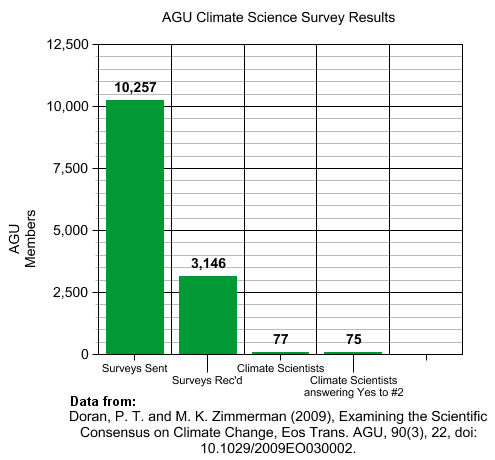 only 2.38 % of AGU members agree Global Warming is manmade, although the figures suggest it’s less than 1%… hardly a 97% consensus !! That’s like surveying medical professionals about the efficacy of homeopathy, and then, after you get the responses back, excluding all the responses… except those from practicing homeopaths. “There is no convincing scientific evidence that human release of carbon dioxide, methane, or other greenhouse gases is causing or will, in the foreseeable future, cause catastrophic heating of the Earth’s atmosphere and disruption of the Earth’s climate. As of 2013, the petition’s website states, “The current list of 31,487 petition signers includes 9,029 PhD; 7,157 MS; 2,586 MD and DVM; and 12,715 BS or equivalent academic degrees. Most of the MD and DVM signers also have underlying degrees in basic science. If you really believe consensus has a place in science, then you have to go with the 31,487 scientists, NOT just 75. Of the 12,464 papers analyzed, 65 explicitly endorse AGW, stating that AGW is 50+% responsible for climate change, and 934 papers explicitly endorse AGW, but does not quantify or minimize. …..that’s just 8% (not 97 %!). And the total number of papers out of 12,000 that actually take the >51% position is . ……. 65 (sixty-five), which is less than the number of papers which reject AGW (83). Showing they had determined the outcome BEFORE doing the study !! Conclusion: The Cook et al. (2013) study is so obviously littered with falsely classified papers making its conclusions baseless and its promotion by those in the media misleading. The other studies also have similar rigged data. No space here to elucidate further. But further inquiry (Legates et al. 2013) revealed that only 41, or 0.3%, of 11,944 learned papers on climate and related topics published in the journals over the 21 years 1991-2011 had stated that recent global warming was mostly manmade.…0.3% not 97 %! The consensus is… there is no consensus & even the IPCC have changed their minds. The “97 percent” claim also ignores 60 scientists who published a document in 2006 lambasting the theory of AGW. And it ignores the international panel of more than 700 prominent scientists on the December 2007 Senate report. This group of climatologists, geologists, oceanographers, biologists, glaciologists, biogeographers, meteorologists, economists, chemists, environmental scientists, physicists, paleo-climatologists and other scientists signed a letter saying climate change was a well-known natural phenomenon. Many of them were current or former members of the IPCC. Something to bear in mind next time a sensational headline catches your eye. Be critical of all statistics that you see, remember 97% of statistics are made up, the other 9% are real !!! Demand a little bit of scientific rigour in showing that there’s a strong, statistically significant correlation. Ask who is funding the study…& why. Nicolas Cage cuts US helicopter deaths by 44% in one year !! What answer options they were offered. Who is funding the study…& why. Walk into any room and ask everybody if they would rather die now or on their 65th birthday. It is extremely likely that almost everybody will pick the 65th birthday option. From this survey you can then safely conclude that nobody wishes to live past 65. Which would make life very difficult indeed as it is just…H2O… water.